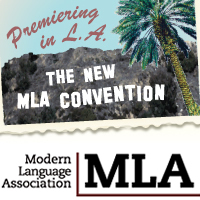 Last week, the Modern Language Association (MLA) held their annual convention in Los Angeles, California. Some 8,000 professors, graduate students, and others in the humanities field were in attendance. They shared papers, listened to lectures, and awaited word from the organization’s executive director, Rosemary Feal, about the state of the job market for those involved in teaching and research. The news was not great, to say the least. Feal explained that the challenges facing the field include crowded classrooms, reduced budgets for salaries, research, and travel grants, as well as work furloughs. Humanities is at a “low plateau,” she said. Part of the problem in staying relevant in our competitive society can be attributed to a misconception that a humanities degree is not as relevant those in other disciplines. Feal argues that this is not the case. Skills in communication and good writing are becoming more and more rare. If you have decided that you need to look for work outside of education, there may be hope. Companies spend thousands of dollars revising documents written by executives with subpar writing skills. Proving that you can save them money and time by being a great writer and communicator may open doors for humanities professionals outside of academia. Computer manufacturer Coleco lost $35 million in a single quarter in 1983–and eventually went out of business–when customers purchased its new Adam line of computers, found the instruction manuals unreadable, and rushed to return their computers. An oil company spent hundreds of thousands of dollars developing a new pesticide…only to discover that the formula had already been worked out five years earlier–by one of the same company’s technicians. He wrote his report so poorly that no one had finished reading it. A nuclear plant supervisor ordered “ten foot long lengths” of radioactive material. Instead of getting the ten-foot lengths it needed, the plant received ten one-foot lengths, at a cost so great it was later classified. Prof. Dorothy Winsor showed “a history of miscommunication” to be one of the root causes of the Challenger disaster in 1986. Of course, a lot of us in education are going to stick it out. Times will get better, surely. In the meantime, you can pick up extra classes at community colleges, look for freelance writing work, tutor, or become an editor at eNotes. We would like to hear your thoughts on the state of classroom education and your plans for the future. Will you stay or will you go?